I used to hate pistachios when I was younger; pistachio ice cream in particular left me completely cold (sorry). That was until I went to Italy and first tried pistachio cream. AMAZEMENT! Pistachios are delicious! In a Nutella-like spread they are nothing short of heavenly. I've been trying to recreate it ever since, and finally, this recipe hits upon something close. 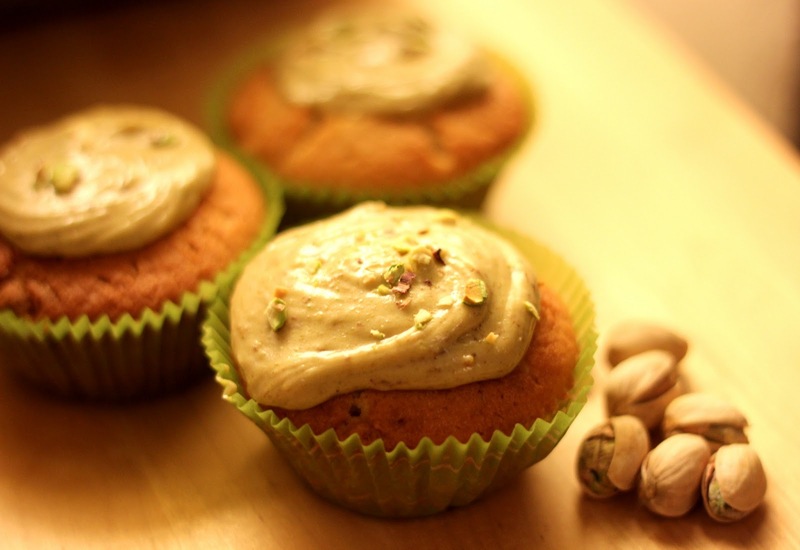 The saltiness the pistachios means that these cupcakes hit a good balance, and are rich without being too sweet. Try to resist using Milky Bars, and go for a good-quality white chocolate instead: it'll make all the difference. Blanch the pistachios for 2-3 minutes in boiling water. Drain and plunge back into cold water. Drain again. Add the icing sugar a little at a time, according to taste, pulsing well in between. The nuts should have formed a thick, smooth-ish paste by this point. Add the pistachio mixture to the cream and fold in, with the spoonful of yoghurt, until combined. Stir in the Greek yoghurt and the vanilla seeds or extract. Sift the flour and baking powder into the mixture gradually, folding in gently with a metal spoon. When the cupcakes are completely cool, take a sharp knife and cut a small inverted cone shape out of the top of the cake (to make room for the cream!). Fill a piping bag with the pistachio cream and pipe into the cupcakes, swirling on top in a circle. Decorate with chopped pistachios and DO NOT LEAVE UNATTENDED. I love recipes where you have to cut a tiny piece off each cake for the icing. Always such a hardship to have to eat them.